PYONGYANG - At the Kim Jong Suk cosmetics factory in Pyongyang, a North Korean tour guide dressed in traditional costume gestured to a wall of photos framed in brass and red velvet. "On that day, the beloved supreme leader gave us a valuable lesson that he will make our country's cosmetics industry world-class level," she told a group of international journalists visiting for the 70th anniversary of North Korea's foundation. At model factories, schools and other facilities shown off to foreign visitors in Pyongyang, a common feature is several rooms devoted exclusively to memorializing previous visits by members of the North's ruling Kim dynasty. "The little museums displaying sacred objects touched by the leader are an integral part of the cult of personality that Kim Il Sung and his crew first developed along Soviet lines," said Bradley Martin, a journalist who wrote a book chronicling the Kim dynasty, referring to Kim Jong Un's grandfather and the country's founding leader. "Those efforts intensified as Kim Jong Il, before taking full power himself and while he was in charge of propaganda, made Kimilsungism into a veritable religion." At their core, the memorials are meant to underscore the supreme leader's personal hand in guiding success at the given facility, analysts say. North Korea's state media has not mentioned what happened to the officials publicly rebuked by Kim, although a recent report by the defector-run website Daily NK said some officials scolded by Kim during his visit to a medical appliances factory last month have been fired and exiled. "It's inevitable that the facilities be given resource increases once Kim visit, regardless of whether they were rebuked or praised, because performance must be improved going forward," Hong said. At the cosmetics factory, the guide credited a visit by former leader Kim Jong Il with doubling soap production. Kim Jong Un's first visit in 2015, meanwhile, led to the construction of a new wing of the factory, she said. 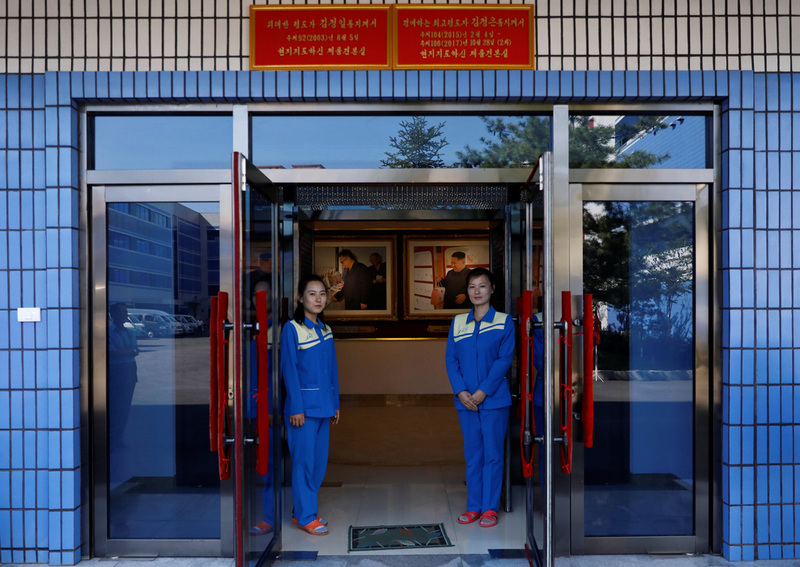 A school for training teachers in Pyongyang also featured rooms packed with memorabilia from the Kims' visits, and plaques were placed over the doors of each classroom the leaders entered, including during a tour by Kim Jong Un in January. "Thanks to our beloved leader's love and care, our university was wonderfully reformed," said a guide at the school. Despite the growth in private markets, Kim Jong Un's visits so far show he still envisions an economy with him at the centre, which may limit the true extent of any reforms, Martin said. "All of our workers and staff thank the beloved supreme leader who loves and takes care (of the people), creating miracles and renovation every day with the robust idea to carry on the task of modernization to the end," she said.